Wanted to share that BasiliskII running through X11 in OSX 10.4 Tiger (and with working slirp ethernet ! ) works perfectly when installed through Pkgsrc for PPC. I've tried using the same BasiliskII from Pkgscr on a MacMini PPC running 10.5 Leopard, but it fails (apparently some libs missing). Pkgsrc for PPC packages are better optimised for Tiger. I built BII from scratch in 10.4 Tiger on my iBook. But it required at least 24+ hours compiling the dependency from macports. My BII build enable SDL to draw emulation and pref editor is Gnome app through X11. BTW, starting app through X11 server remotely via ssh is extremely slow. Nice. What's that bar on the left side of your screen? Those squares look exactly like NeXT's plugin system that eventually morphed into the OS X dock. And the X Windows window looks just like the old NeXT widgets. 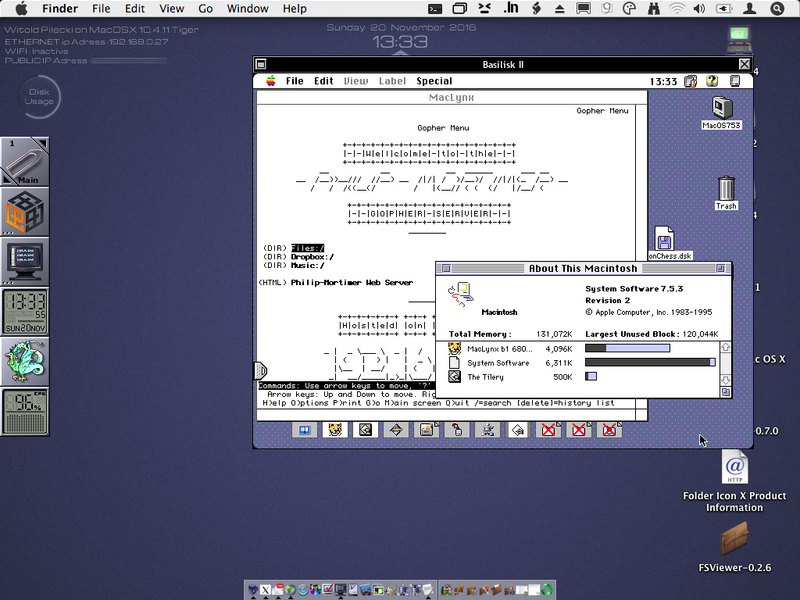 The bar is WindowMaker 0.95.7 dock with wmclockmon and wmcpuload dock apps running. Also installed from Pkgsrc for ppc. Rickyzhang - have you tried ssh -X a minivmac ? It's pretty usable. Depend of the machine of course. I have minivmac installed in ARM board Odroid U2. Except playing game, it works quite well through X Server. But it really depends on network speed. All my ARM board has HDMI. If I run any UI, I'd connect to TV directly. BTW, I think it would be fun to build a retro Mac by emulating them in ARM board, home-brew Mac case and LCD screen. The reto mac case takes time to build. I think Apple still has patent on its case design. Thus, you can't find CAD file to build it from 3D printer. Apple can't still have a patent on the 128K Mac design; that design was patented in 1983. Aren't patents 30 years in the US? That means that any design Mac Plus and earlier should be fair game now (except where they've extended the design patent). That said, you could also just find an old broken unibody Mac enclosure on eBay or at a flea market and retrofit it. Or go older, and drop it all into a custom Apple enclosure (since those were hobby kits to begin with). Yes, that's what i used, a empty Mac Classic case, with a R-pi3 and a lcd of the correct size. It can run minivmac or BII. I'm going to spend time (if possible) in Thanksgiving weekend to study CAD software to draw Mac case. There is a plenty 3D printer service online. You can always design it in Sketchup and then export to DXF (AutoCAD). Lots of base models at https://3dwarehouse.sketchup.com/search ... Class=both although I'm not sure how many of them are CAD-level (proper measurements, using objects and groups, etc.). This will give you the outside, and then you have to work on adjusting the inside mounts to fit your hardware. just FYI: VNC has an invert function built in too, which will fix the colors.